Keeping rubbish sorted in any business can be a nightmare. This is especially the case for owners of self catering accommodation, where you need to make it very clear for your visitors. Labeling the bins is essential. 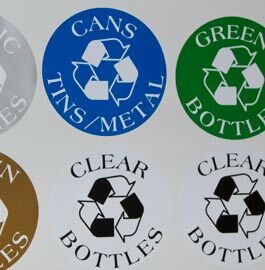 We have a standard range of bin stickers designed to use on recycling bins. These stickers have been printed on a special high tack vinyl with a satin finish. They have extra strong adhesive for difficult-to-stick surfaces, such as smooth painted or unpainted concrete and polyethylene or polypropylene surfaces such as bins. Choose from any combination of the following standard recycling bin stickers. We can also print stickers any way you want them. Our designers will create your stickers in any colours, fonts and size. 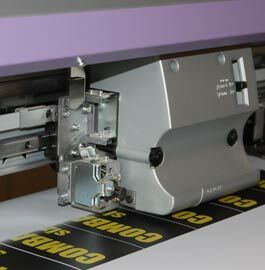 The prices below can combine a number of stickers on one printed sheet, each sticker being cut around the outline. You will need to allow 5mm space around each sticker. NB. We only use good quality industry standard vinyls. However we cannot guarantee that they will stick to every surface, or the effect the adhesive will have on that surface. The conditions under which you apply the vinyl can also effect adhesion. Most vinyl should be applied at room temperature onto a clean smooth surface. Click here for helpful information about application. Our team at The Sign Maker looks forward to helping you with your recycling bin stickers.